This goes on like this and finally at 30’s, there is only blue and grey. This is because water can absorb the colors from the light passing through it. So, we not only loose the light as it becomes deeper, but also the color. When you see a grey fish in 30 meters, for instance, you must think that maybe it is red… And when you aim an underwater torch to that fish, you can give it its real color again. This is also valid for videos, for sure. Which Diving Light to Use For GoPro? 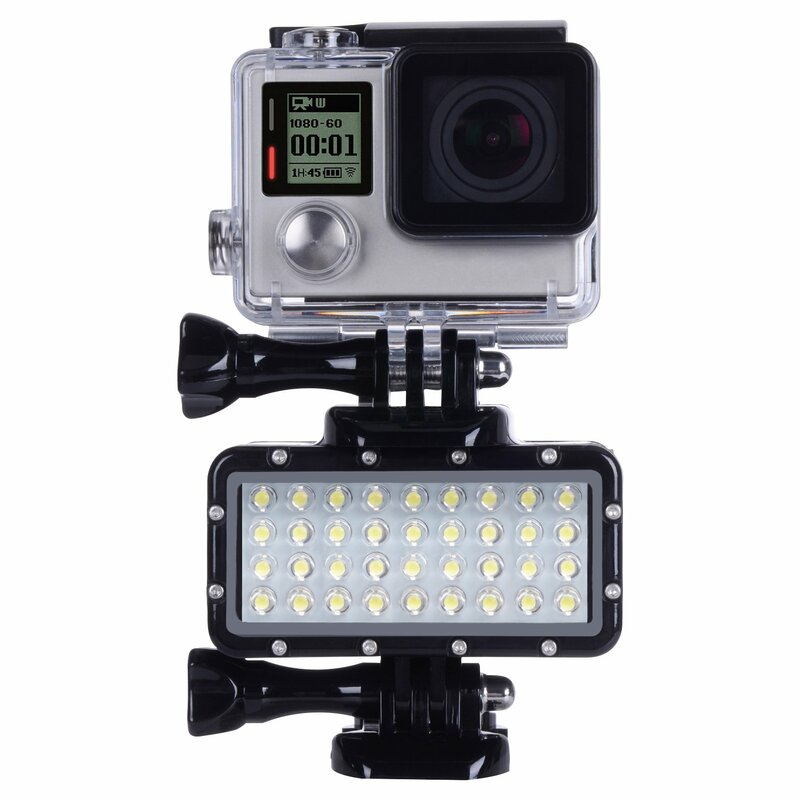 There are dozens of brands and models of diving (underwater) lights for GoPro in the market. I want to suggest you the ones that I am using with my own GoPros below. What I will be suggesting you to use is the brand: Suptig. It is safe and works really fine if you are an amateur underwater photographer/videographer like me. 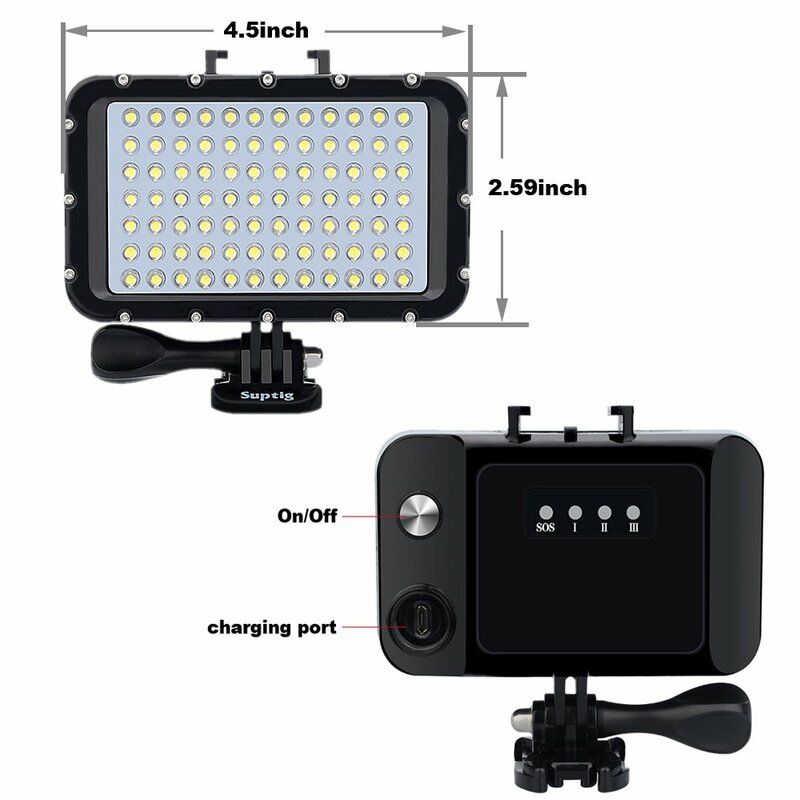 This light is compatible for GoPro Hero 6, GoPro Hero 5 and Hero 5 Session, GoPro Hero 4 and Hero 4 Session, GoPro Hero 3 and Hero 3+ and GoPro Hero 2. I listed the compatible GoPro versions, but this diving light is also compatible with the majority of the actions cams. Very light (0.18Lb) and small (2.95 in(L) x 1.65 in(W) x 2.75 in(H)), which makes it easy to carry without the fear of entanglement. 500 Lumen maximum (5500K-6000K), that is to say, it is quite powerful in proportion to its size. Normal, Power saving and Flash (SOS for emergencies) that I have never used thankfully. I advise you to use the normal mode, because power saving is not giving you what you expect. The battery is rechargeable and it is 1050 mAh. In normal mode, the battery lasts in 1.5 hours, so you can complete two dives without charging the battery in average. In power saving mode, it is 4 hours and in flashing mode it is 6 hours. The best part is, when the battery starts to make you sick and start to last only for 20 mins, you can replace it. Note: I don’t advise you to use this GoPro diving light in your night dives as your primary dive torch even though some users and the producers declare that you can. However, as a primary dive torch in your night dives, you definitely need a much more powerful dive light. 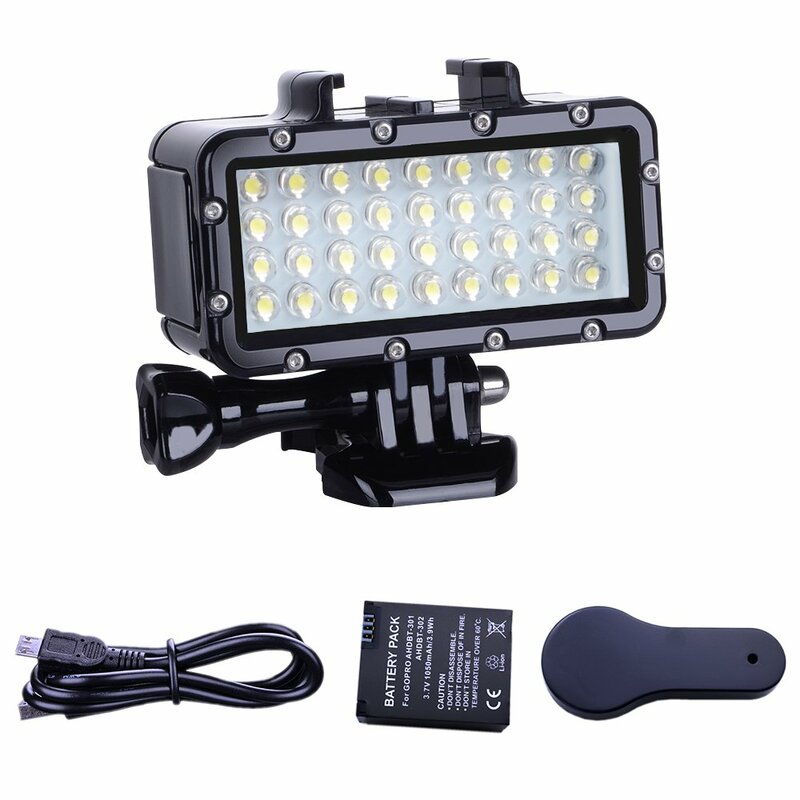 Please buy and use this light only for underwater photography/videography. I use this light when the weather is darker, maybe in late afternoon and/or early evening dives, also in rainy and cloudy days. With its 56 LEDs, it is more powerful than the other model mentioned above. I made couple of dives with Suptig 56 Led Diving Light for GoPro when it was raining like cats and dogs and the result were more than I expected. Again, this diving light is compatible for the majority of the GoPros and other action cams, as well as the popular SLRs (check out the link for details). High Light (battery lasts in 2,5 hours) , Medium Light (battery lasts in 3,5 hours), Low Light (battery lasts in 5 hours) and SOS (battery lasts in 9 hours). Its battery is 2600 mAh. I use both of these diving lights for my GoPros and I am happy with them. There were numerous divewithseaman.com readers that ask for a diving light compatible with GoPro. It took some time for me to purchase and test some diving lights for our GoPros, but decided on these two. You can write anything you’d like to share/ask by using the comment section below.